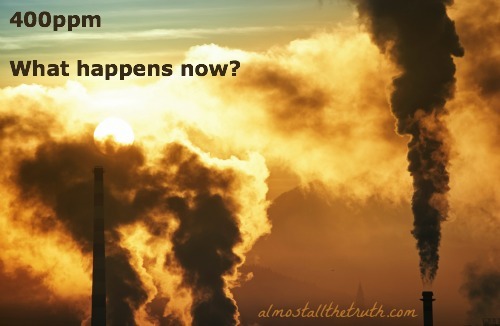 Home→Blog→activism→400 ppm, What Happens Now? Since I’m CelloMom, I feel compelled to answer: drive less! (In truth, I still drive a car. But I’m also part of a three-house school rideshare, and a five-house rideshare for the dairy run. And I use my bike when I can: I try to schedule all my car-borne errands on at most two days a week. Our house has a weekly car-free day). Next step: if you must buy a car, right-size it: buy one with as many seats as there are family members. And buy it with the smallest engine available: even that will still be too large. There are so many small changes that each of us can make! I would have to place eating less meat at the top of my list. It’s been estimated that the meat industry generates nearly one-fifth of the man-made greenhouse gas emissions that accelerate climate change. That is a really good one! Especially for those who eat a significant amount of meat without knowing its source. Most of us know that trees help us deal with some of the CO2 we create … they breathe it in and return clean oxygen back to us. What many may not know is that the CO2 is stored in the tree and every time we cut one down, all of its stored CO2 is released into the atmosphere. So my suggestion is to reduce our use of anything made from wood or wood products. Ah, a good ol’ tree hugger. :) The rates of deforestation are staggering, although I think they go well beyond using the trees for wood and wood products unfortunately. I am curious what you think about sustainable tree farms? I guess if I am honest I think we have gone too far. I think the time we could have turned it around was the 1970s before the majority of people were even aware there was a problem. But we can still play things out as long as possible and I think we have to accept wind farms on our doorsteps even if they are noisy. Well said, Brenna. As far as I am concerned, the time is still now and we are rife with opportunity. The most substantial change we need to make is one of cultural perspective. Despite the frontage that the environment has garnered over the past decade, the concept of sustainability hasn’t reached enough of us yet. The problem is that sustainability is too often marketed as a technological fix to supplement a wasteful lifestyle. It creates the idea that enough gadgets and gizmos can allow our lifestyle to remain the same while trimming the excess through technology. The truth is that sustainability is the lifestyle. It’s a mentality that revolves around the idea of balance and stasis. Recognizing this underscores that our ability to make progress hinges on our readiness to change the way we live. The more people that can accept that and be open to a solution that involves material change, the closer we’ll be to gaining some ground.